If you have the time, stop by their Web sites to see what they have to offer for raw foodists! 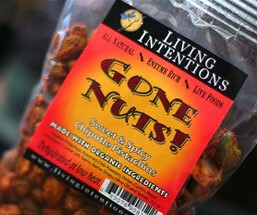 Living Intentions has some amazing nut snacks, and NaturalZing is a health store that offers a large variety of raw food snacks and supplies. I am thankful for the generosity of the many companies who will be stuffing the retreat gift baskets with tasty raw treats. It overwhelms me, in a good way, that there are genuinely kind and giving people in this world. I've met a lot of nice people, but I truly believe that those involved with a raw food lifestyle are some of the nicest.I am thankful to be on this raw food journey, for it brings me in touch with more and more genuinely caring and loving individuals. ? I am so very thankful to all of the companies who are generously supplying those at the 3-Day Raw Food Spiritual Ashram Retreat with delicious, healthy raw food snacks! I love those companies! Yes I agree, I have met more truly happy and positive people in the raw food community than anywhere else!